Yep, I put a little Bicardi Limon Rum in these. You can leave it out if you want, but I like having treats that are for adults only sometimes. 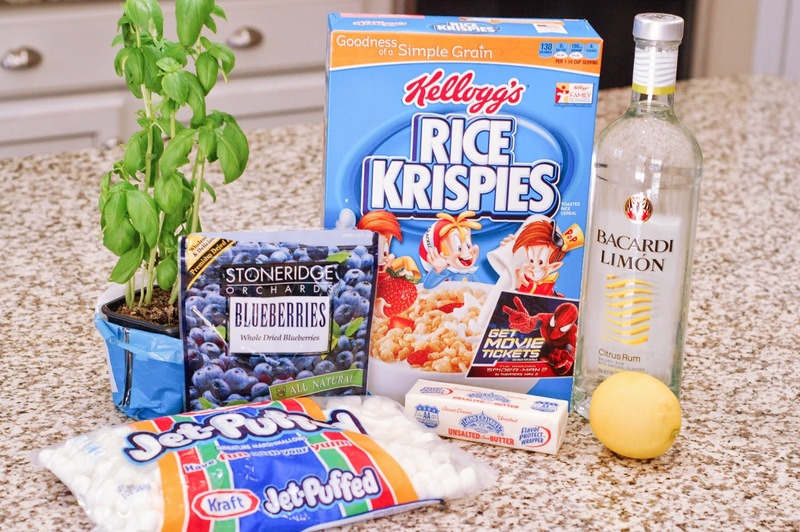 This recipe is adapted from my Lemon Meringue Rice Krispie Treats and my Lime Coconut Rice Krispie Treat with Tequila. I used fresh lemon and basil to add lots of flavor. I have not had success in adding fresh fruit to Rice Krispie treats, so I used dried whole blueberries. For the frosting, I kept it light. I adapted a basic marshmallow fluff frosting recipe like I did for my Chocolate Pumpkin Rice Krispie Treats. It's really easy to make, it had a nice texture, and it tastes great. The overall results were perfect. 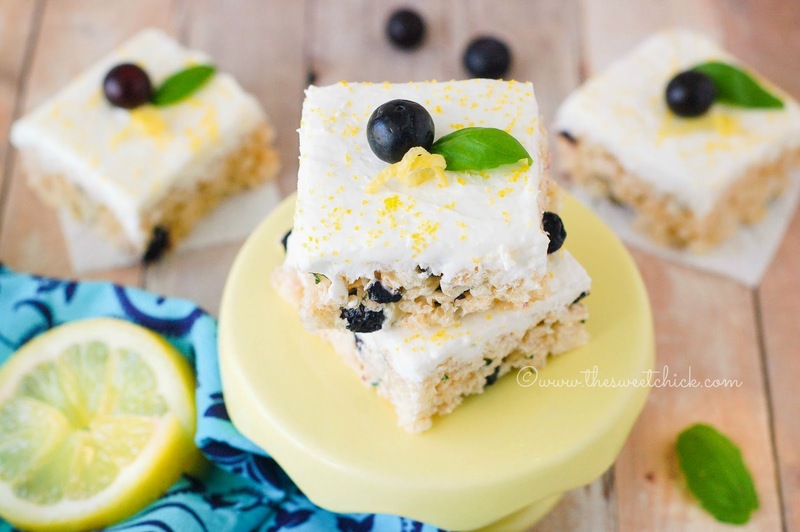 You've got the tartness of the lemon, the sweetness of the blueberries and the frosting, with a hint of basil. You really don't taste the alcohol. The flavors are all light and summery. They are so easy to put together and you don't need to bake. These would be perfect for a picnic. I may need to make another batch for our Memorial Day picnic coming up this weekend. We are getting together with a bunch of neighbors to celebrate. 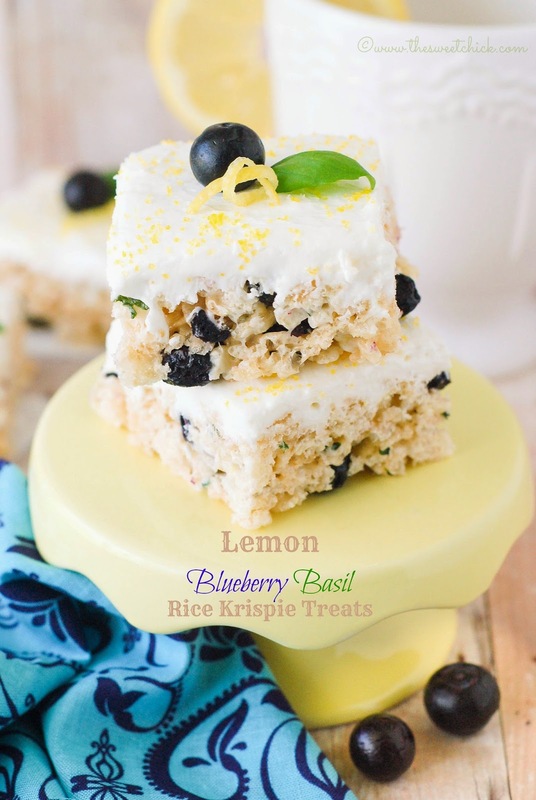 I think they are going to like these Lemon Blueberry Basil Rice Krispie Treats too. Remove from heat and add lemon juice, zest, and rum. Stir until completely mixed. 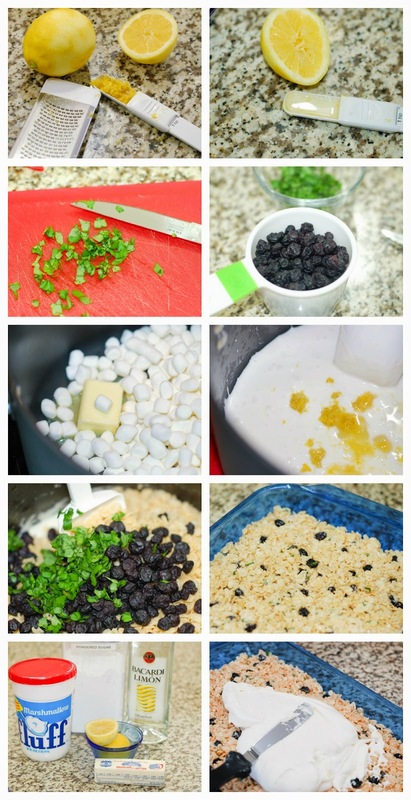 Then add the Rice Krispie cereal, dried blueberries, and the basil. Mix until all is well incorporated. Add the lemon juice, zest, and rum and mix until well blended. Spread over the cooled treats and place back into the fridge to set. Once the frosting is set, cut the treats into squares and serve ( you can add yellow or blue sprinkles if you like). Enjoy! These look delicious. Pinned - especially for your frosting recipe! This sounds like only the best things ever. I will be pinning and making it for a multitude of things this year! Thanks a lot! !